DIY Holiday Fair is Saturday!! The annual DIY Holiday Fair is this Saturday! Support local DIY record/tape/cd labels, artists, crafters, printers, and more. Give unique and handmade gifts to your friends and loved ones. With DJ sets by SassyBlack and Hollow Earth Radio DJs! It’s with a little sadness, much gratitude, and a lot of optimism that I announce that I’ll be stepping down as Executive Director at the turn of the year. Leading The Vera Project these last two and half years has been the most challenging and rewarding adventure of my professional life. I feel so blessed to be a part of this community, and I know that now we are ready for me to pass the baton. Together we—Vera’s volunteers & members, staff & board, and each and every one of you!—have brought this organization so far. Our finances are stable; we’ve negotiated a new lease and are making critical improvements to the venue and operations; we’ve reestablished old relationships and build new ones both internally and with external funding, programming and community partners; we’ve welcomed some great new staff and board members; and we’ll soon launch a new website and new branding. I’m so proud of the work we’ve done and the community we’ve sustained and strengthened. Now that we’ve gotten Vera back on firm footing, it’s time for the organization to leap into the next exciting era. This leadership transition is a part of that, and I’m confident that this community will emerge from it ready to take on the world. Though I’m transiting out of my current role, please know that I’ll always be a loud booster and proud donor, and you’ll still spot me at shows. In the meantime, I will be spending next few months working hard to ensure The Vera Project is set up for success on all fronts. I would like to invite you to help here, too, by donating to The Vera Project’s Fall Fund Drive. Investing in our community now is a critical to ensuring the next Vera era will be the best one yet. Thank you, truly and sincerely, for everything these last few years and Viva Vera!! To apply for the Executive Director job, visit our Job Listings page or click here to access the posting directly! Give today to the Vera Fall Fund Drive! If you are younger and you are questioning things like sexuality or gender, those things are constantly being questioned outside in the world. But Vera is a space where your identity will not be questioned, where you simply can be. How did you find Vera? I went to a show. I saved up for two weeks just so I could go to that one show. A friend at the show told me if I wanted to see more shows, I should just volunteer at the Vera Project. And that’s how I got involved! What is your favorite Vera memory? My favorite show, weirdly enough, was Why Don’t We, a boy band. I loved the unfiltered passion of the people at that show (who were all under 18 except two people). Just to see that enthusiasm for something– and it’s not being judged, and it’s not being shamed. You just couldn’t help but smile. I know I went through the same thing when I saw Courtney Love when I was 15 or 16. How would your life be different without Vera? I don’t think I would be involved in the music industry or want to go into the career that I want to go into. I want to be a publicist at a label. It sounds like a hyperbole, but I genuinely don’t think I would be on track to do what I want to do right now without Vera. We’ve currently raised $2,500 of our $15,000 Fall Fund Drive goal. Let’s double that TODAY to get us 1/3 of the way there! Every donations counts. Any amount counts. Donate today to support all-ages music and DIY art in Seattle. Click the above image, or go to our donate page. 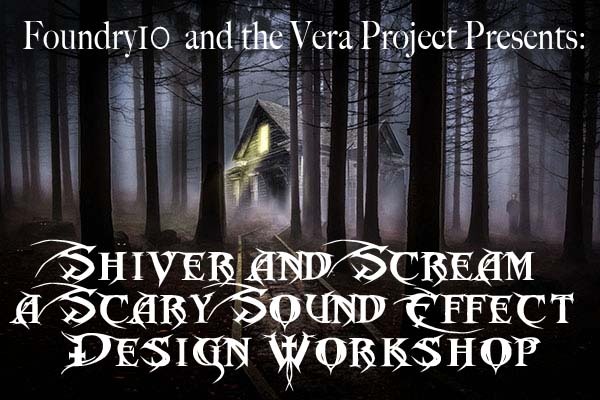 Just in time for the Halloween holiday, Shiver and Scream is a free four hour workshop that will teach you how to take (or make) sounds, either those that they record or from a library, and manipulate into a spooky soundscape. You will then work to restore a scene from a campy horror flick, applying the same professional sound design techniques used in gaming and movies. 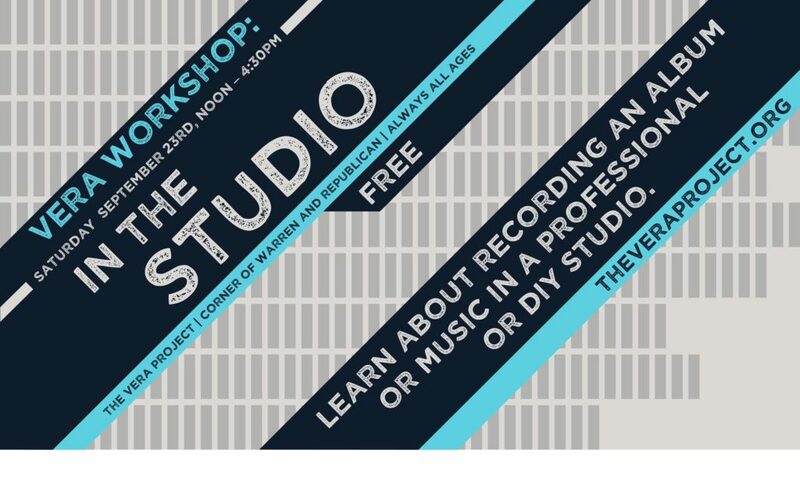 This is a free workshop! Joshua Du Chene is a composer, sound designer, Foley artist, musician, and educator in the Seattle indie games community. He has been a maker of sounds ever since he discovered he could hum whilst consuming Gerber applesauce in his He-Man high-chair. Now he just does it with more expensive equipment. Joshua holds a Master of Education degree from Oregon State University and has presented on audio at the PAX Developer’s Conference, Seattle Startup Week, the SIXR Cinematic VR Challenge, and at Shoreline College. Foundry10 is a philanthropic research organization dedicated to finding new and interesting ways to create value for youth today. We partner with communities and schools to try new approaches to learning, across a broad range of subjects and environments. 2017 Viva Vera Fall Fund Drive begins! The Viva Vera Fall Fund Drive Has Begun! 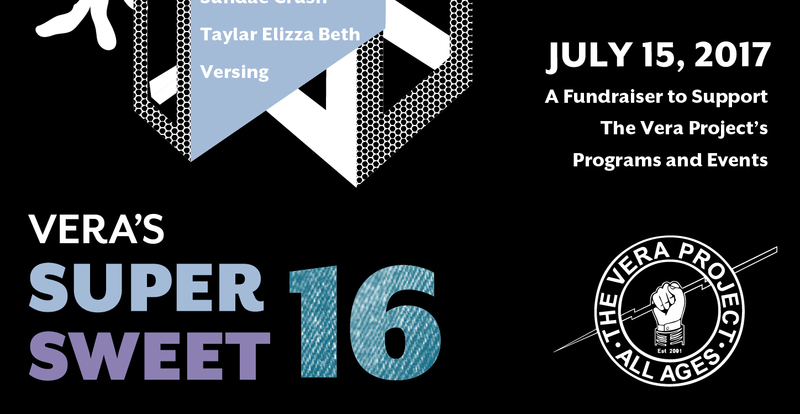 The annual Fall Fund Drive raises important money needed to keep the lights on and the music playing for another year at the Vera Project. 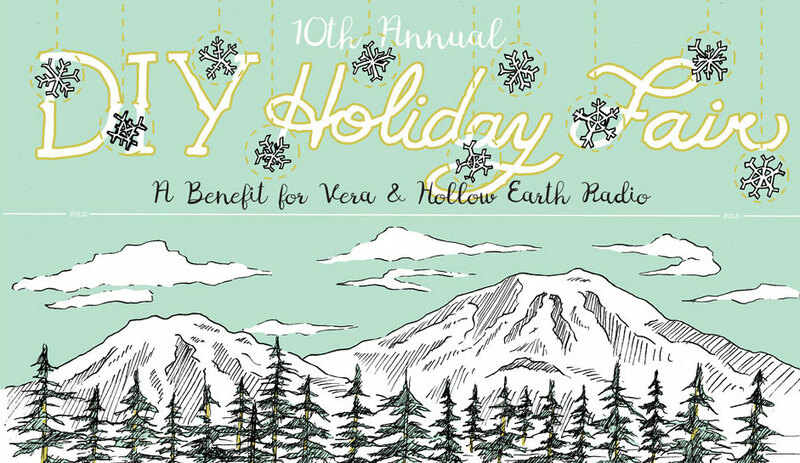 From today until December 31st we will collect donations to fund all of the programs and events you love here at Vera. A huge thank you to Barsuk Records for being the very first donor to Fall Fund Drive 2017 and getting us started with a $1,500 donation! Barsuk Records is a beloved independent record label here in Seattle since 1998, and they have always been staunch supporters of the Seattle DIY music scene. Because of Barsuk Records we have already raised $1,500 out of our $15,000 goal, and YOU can help us get the rest of the way before December 31st! Simply visit www.theveraproject.org/donate to support The Vera Project. Every donations counts. Any amount counts. Donate today to support all-ages music and DIY art in Seattle. Thank you for all of the ways you support the Vera Project. We wouldn’t be here without you! Learn what it takes to succesfully record an EP or an album from the experts who do it for a living! From DIY recording to professional studios, from recording to mastering, this workshop will teach you what it takes to create a great release for your band or project. This opening portion of the event features an industry professional playing 5-8 recognizable songs and relaying their recording information. In this session attendees may hear something that sounds like their own music. Conversation One: What is a Recording Studio? Who do you encounter in the studio? What is a studio? Role of the producer – why would you need this? Role of the engineer. What are my options in Seattle? What do I need to do before I start recording? Artists, a studio owner, and an engineer discuss balancing budget vs comfort vs quality, how much time preparation takes, what exactly a producer is, and why recording is so different from artist to artist and studio to studio. Also features some discussion of DIY vs Professional and everything in between. Break Out One: DIY vs Professional – I’ve never been in a studio! Help! Please join us for a drink (or many!) 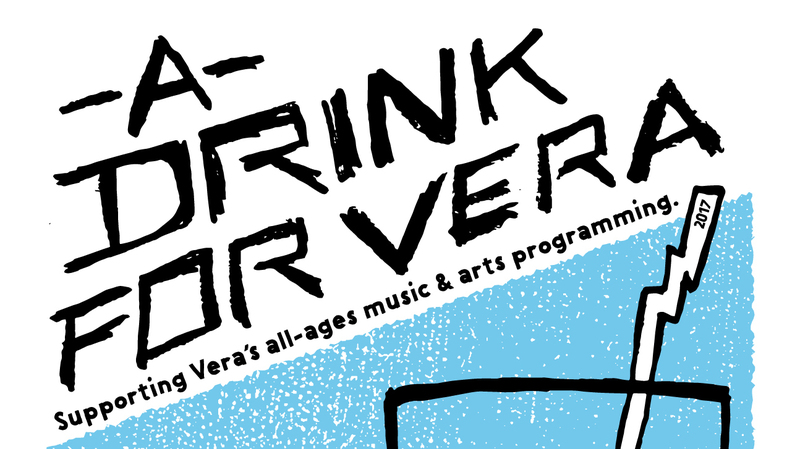 in support of Vera’s all-ages music & arts programming! All proceeds from select drink specials will go directly to Vera. Thank you to our sponsors, Tito’s Vodka, Montucky Cold Snacks, and The Stranger! featuring performances by Vacationeer & more! Vera’s Super Sweet 16 this Saturday! We’re turning 16 this year, and we’re celebrating with a sweet 16 party! 16 bands, two stages, beer, cupcakes, a raffle, and all to benefit your favorite all-ages art and music space!! 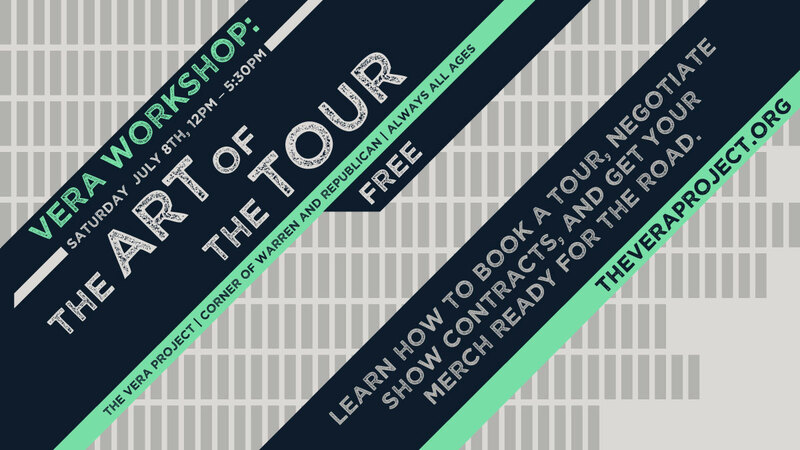 A FREE workshop designed to help up & coming bands learn the skills necessary to plan and complete a successful tour! Featuring panels and talks with Lisa Prank, IVVY, Emma Lee Toyoda, Ryan Nails Leyva, Votiv, Jason Clackley, Jodi Ecklund, and Shenandoah Davis! Summer is finally here, so we’re raising our glasses in support of The Vera Project! Join us at one (or more!) of the following nights. All proceeds from Montucky Cold Snacks and specialty cocktails made with Tito’s Voka go directly to Vera!